Happy 103rd birthday, with many more to come. It is my first playlist for a living composer this year, though Carter is actually older than Britten, Cage, Schnittke, Stockhausen and Xenakis. His great Indian summer still lives on, and recordings of his new compositions are coming out steadily, so I compiled this playlist in reverse chronological order. If you are not familiar with Carter, you may start with the first few tracks of his most recent works, then try String Quartet No.1 (it quotes from Ives, whom Carter befriended in the 1920s), Cello Sonata, and the Clarinet Concerto. 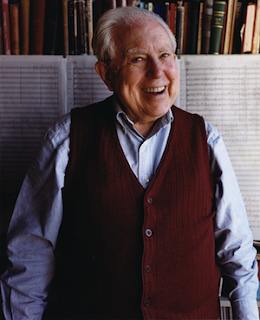 Here's the Spotify playlist: Elliott Carter: A Reverse Chronological Collection (211 tracks from more than 50 recordings, total time: 18 hours) Ctrl (CMD)+G to browse in album view. To accompany your listening: an informative article on Carter's 101th birthday, from two years ago, including pictures of Carter with Bernstein, Cage and Stravinsky; Richard Taruskin's article on Carter, a standalone chapter from The Oxford History of Western Music, on Google Books. Below is a list of works in this playlist, all linked to introductory articles. The Bridge Carter Edition will appear on Spotify soon, and the post/playlist will then be greatly expanded.